--Geronda [Elder], when a person dies, does he become immediately aware of his spiritual condition? --Yes, he does, and says to himself, "What have I done?" But the result in fayda yok, [An expression in the Turkish language, which means: "There is no benefit, there is no progress or success".) that is, this awareness is of no benefit. This can be likened to a drunk man who kills his mother and goes on singing and laughing, but who, upon becoming sober and realizing what he has done, will wail and lament and say, "What have I done?" In much the same way, those who commit wrongdoings in this life are like drunken men. They don't understand what they're doing; they don't have a sense of their guilt. But when they die, this "drunkenness" disappears and they become aware of their real condition. The eyes of their soul are opened and they realize their guilt, because the soul, when separated from the body, moves, sees and perceives with an inconceivable speed. Some people ask when the Second Coming will take place. But for the person who dies, the Second Coming is, in a way, taking place, because he is judged on the basis of the state in which he is found at the time of death. --Geronda [Elder], in what state are the souls of the tormented found at this time? --They are indicted, imprisoned, and suffer in accordance with the sins they had committed; and they await the final trial, the future Judgment. There are those who have been indicted, facing heavy sentences, and those who have been indicted, facing lighter sentences. --The Saints and the thief are in Paradise; but they have not received the final glory, just as those who have been indicted are in hell but have not received the final sentence. Even though God has taught us from centuries ago: "Repent ye, for the Kingdom of Heaven is at hand?" (St. Matthew 3:2 and 4:17) He extends the time more and more, because He waits for us (with the pronoun "us", the Elder means all of humanity) to correct ourselves. But we, by remaining in our (unrepentant) misery, are unjust to the Saints because they cannot receive the final glory, which they are to receive after the future judgment. --Geronda [Elder], can the indicted souls who await trial pray? --They are aware of their condition and seek help, but they cannot help themselves. Those who are in Hades desire only one thing from Christ: to live for five minutes in order to repent. We, who live, still have time for repentance, but those unfortunate ones who have fallen asleep cannot improve their condition on their own; they await help from us. This is the reason why we have an obligation to help them with our prayer. --It is my belief that only about ten percent of the indicted dead awaiting trial are, as the demons do. They don't seek any help, and they also reject all help. For what can God do for them? It's like a child who has alienated himself from his father, squanders all of his property, and on top of that, curses him. What can his father do for him? But the other indicted ones, who still have a little philotimo, are aware of their guilt. They repent and are tormented because of their sins. They ask to be helped and are helped through the prayers of the faithful. 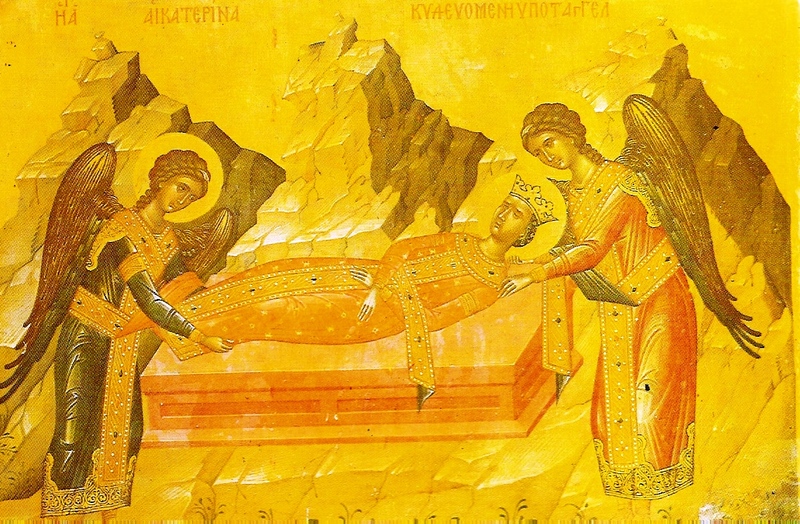 [Saint Nectarios, in his study, A Treatise on the Immortality of the Soul and on the Sacred Memorials, ed. Basil Regopoulos, Thessaloniki 1973, p. 202, writes as a conclusion to what he developed on the basis of the witness of the Holy Fathers: "On the basis of all the above, it becomes clear that the soul after death is unable to do any solitary deed and be relieved from the indissoluble bonds of Hades. Only the Divine Liturgies, the prayers of family members, of the just, which are offered for them, including charity, become instrumental agents of deliverance and freedom from the bonds of Hades."] In other words, God provides an opportunity for them, now that they are awaiting trial, to be helped until the Second Coming takes place. And just as in this life when one who's a friend of the king can intercede and request help for someone awaiting trial, so, too, if one is "a friend" of God, he can intercede with prayer to God, and He can transfer the indicted souls of the dead from one "prison" to another, better one, from one "detention-cell" to another, better one. Or God may transfer them to a "room" or to an "apartment". Just as we provide some comfort to the imprisoned with the refreshments and other material goods we bring to them, so are the dead refreshed by the prayers and the charity we execute for their souls. The prayers and the sacred memorial offered by the living for the dead are the final chance that God gives to the dead to be helped until the Final Judgment takes place. After the Judgment, there will no longer be any possibility for help. God wants to help those who have fallen asleep because He cares about their ultimate salvation; but He does not help because He has a noble spirit. He does not want to give the devil the right to say: "How can you save him, since he did not labor to achieve it?" But when we pray for those who have fallen asleep, we give God the right to intervene. God is moved more by our prayers for the dead than by those for the living. This is the reason why our Church has the sacred memorials with the kollyva. [Kollyva (κόλλυβα): boiled wheat kernels. The wheat kernels express belief in everlasting life, according to what Jesus said, "Except a grain of wheat fall into the ground and die, it abideth alone; but if it die, it bringeth forth much fruit" (St. John 12:24). It is a tradition among Orthodox Christians to bring a tray of boiled wheat kernels to church for the Memorial Service.] Memorials serve as the best attorney on behalf of the souls of those fallen asleep. They even have the power to bring a soul out of hell. At every Divine Liturgy, we should pray with kollyva for those who have fallen asleep. The wheat has a symbolic meaning: "It is sown in corruption; it is raided in incorruption" (1 Cor. 15:42) according to Sacred Scripture. Some people can't be bothered to boil some wheat and instead bring raisins, cookies or other pastries so that the priest may bless those things. 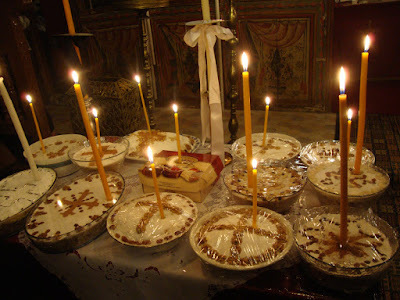 Up on the Holy Mountain, there are some elderly monks who will prepare kollyva for every Divine Liturgy for those who have fallen asleep in the hope of the Resurrection and for the Saint commemorated that day, in order to have his blessing. --Geronda [Elder], how is the soul purified? --When a person observes the Commandments of God, working to be cleansed of one's own passions, then the mind is enlightened; it attains spiritual vision, and the soul becomes as resplendent as it was before the Fall of man. This is the condition he will be in after the resurrection of the dead. But one can see the resurrection of his soul before the General Resurrection only if he is cleansed entirely from the passions. Then, his body will be Angelic, incorporeal, and will not be concerned with material nourishment. --Geronda [Elder], how will the future Judgment take place? --Geronda [Elder], I have brought some sweets for you to offer to your guests. --Look how happy they are with that! In the other life we will be saying to ourselves, "In what foolish things we found joy! What things inspired us then!" While now our heart flutters over such things. --Geronda [Elder], how can we understand this at this point in time? --Geronda [Elder}, in the other life will those in Hell see those in Paradise? 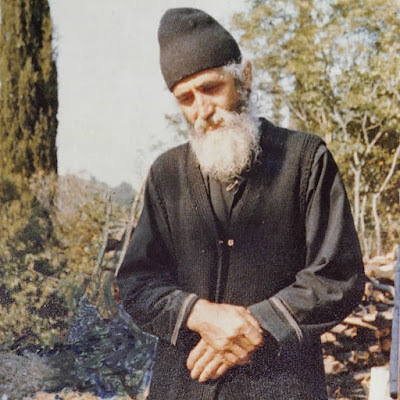 Elder Symeon Kragiopoulos: "Make good use of pain..."
How good it would have been if we did not let pain go to waste! One way or another we will suffer. But our whole torture and struggle will go down the drain, unless we make good use of pain, unless we exploit it. We make good use of pain, we exploit pain when we take the correct stance. There comes a time when someone feels the great good which comes out of pain and –no matter how strange it may seem– he says: “Nothing else benefits humanity as much as pain”. When we talk about pain, we generally mean sickness and the overall physical decline of man and death. If it hadn’t been for these, we would have been like brutal beasts. Society would have been a jungle. But thanks to them, we get tamer. A Christian is capable of making such good use of every pain, so that he can constantly be in paradise. Know this: When pain will have completed the work it is supposed to do, God takes away. It is not difficult at all for God to remove whichever pain. Let there be no complaint, no rebellion, no kicking about. If possible, whichever pain you have, deal with it by saying these words: “Let it be blessed, my God. Whatever You want.” This way our pain won’t get wasted, but will be exploited to the full. We will take advantage of it, and the great good which saves will come to our hearts. 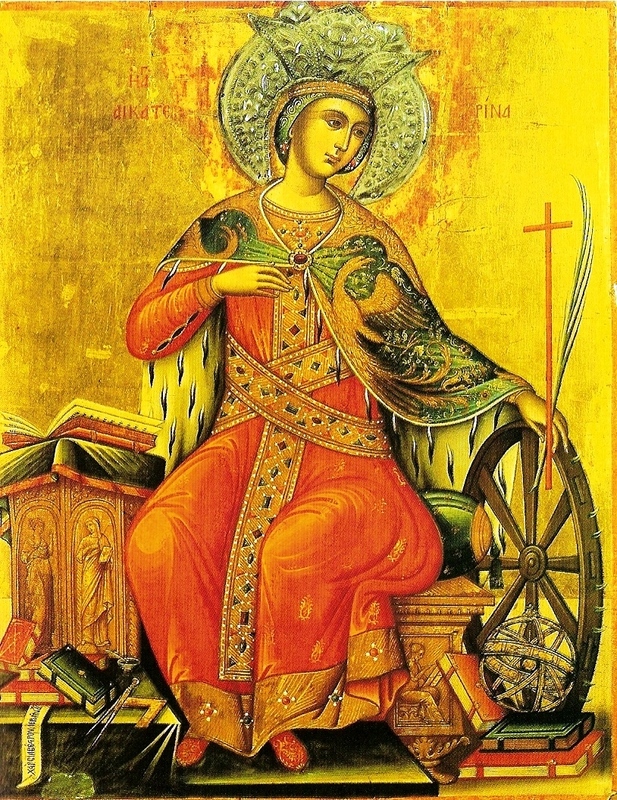 Kontakion in the Plagal of the Fourth Tone. 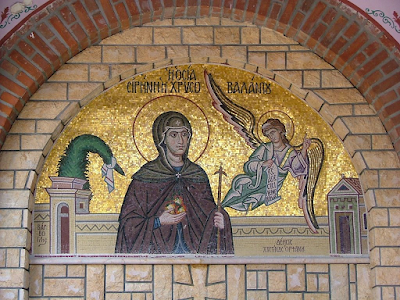 As the pinnacle of Venerable Saints and Virgins, and a true and greatly flowing spring of wonders, we honor you, O Venerable Mother Irene, but as one nourished with the peace of the Spirit, keep us in the bond of peace, for those who cry out to you: Rejoice, O Mother, equal to the Angels. Rejoice, through whom the enemy was consumed. Rejoice, the cedar of manliness that is unshaken. Rejoice, depth of notable and soul-nourishing gifts. Rejoice, for you became the chastity of virgins. Rejoice, you who uproot the tares of the passions. Rejoice, through whom delusion groans. Rejoice, O Mother, equal to the Angels. You were the perfect and all-joyous root of good planting, and from your youth you were distinguished as beautiful in appearance, but surpassingly beautiful in soul, and you were guided and ordered by fear of the age to come, crying out: Alleluia. Rejoice, partaker of earthly deprivation. Rejoice, spotless diadem of radiant youth. Rejoice, joyous fragrance of the Angels. Rejoice, gladsome beauty of souls. Rejoice, radiant adornment of virtues. You disdained all worldly glory and the time of your youth and superficial honor, counting them as refuse, that you might gain Christ, Whom you loved. And He casts down fire from heaven upon those who chant unto you with fervor: Alleluia. Rejoice, radiance of unspeakable joy. Rejoice, tree heavy-laden with all kinds of noetic fruit. Rejoice, unemptying spring of graces. Rejoice, waterfall of many healings. 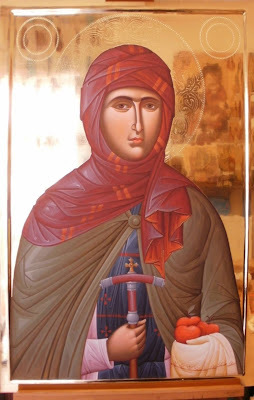 You lived according to the writings [of the Scriptures] and with divine praise, you were silent and spoke, O Venerable one, and you were shown to be full of exalted works, O Mother of the ranks of Monastics, whom you taught, and who cry out together with you: Alleluia. Rejoice, the pillar of many struggles. Rejoice, you who glorified the grace of the Savior. Rejoice, all-honored statue standing immovable. Rejoice, enclosure keeping out the enemy. Rejoice, ray of heavenly peace. Rejoice, vessel towards unapproachable peace. 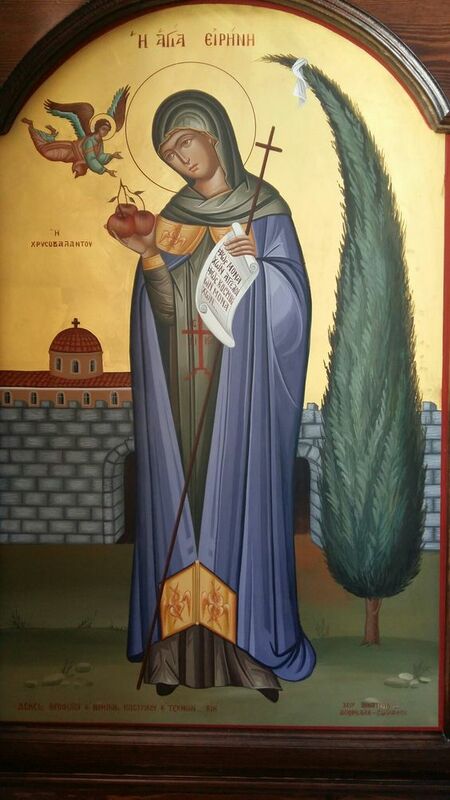 Through divine providence, you received the abbacy of your Monastery, O Venerable one, and you lead it truly with instruction and greater education, by word and example, confirming those who chanted: Alleluia. Rejoice, fellow dweller with, and equal to the Angels. Rejoice, peaceful gaze for troubled hearts. Rejoice, light for those laying in darkness. Rejoice, lifting up of many fallen ones. Rejoice, remover of terrible passions. Beholding the Angel's presence, O Venerable one, as a ray of divine light, you hymned the Source of light, and were lead by the angels to heal those who cry out: Alleluia. Rejoice vessel of unsurpassable beauty. Rejoice, lark of the breath of grace. Rejoice, type no lesser than the wise Arsenios. Rejoice, for you impart twice as many hearings. Rejoice, lamb marked by Christ God. Rejoice, tuneful song of swallows. Enduring the evil that the prince of darkness breathed against you, as the senseless one waged war against you with temptations. But you wholly laughed at him, and stood as steadfast as a diamond, gazing upon Christ, and never ceasing to chant: Alleluia. Rejoice, the dissolver of evil forces. Rejoice, fully-laden olive tree of gifts. Rejoice, sharp blade cutting away magic energy. Rejoice, for you depose the mania of the demons. Rejoice, savior of lost souls. Rejoice, shield and foundation for those storm-tossed. Strange deeds and various wonders are seen worked by you, O God-bearer, for you hearkened to every voice of those in need and you could tell of their futures beforehand, compelling all to cry out: Alleluia. Rejoice, the wealth of sympathy. Rejoice, the sacred resemblance to the bodiless [Angels]. Rejoice, shining account of the angelic life. Rejoice, most-fervent helper of those who are wronged. Rejoice, savior of the blood of the righteous. Rejoice, you who inform of future things while awake. 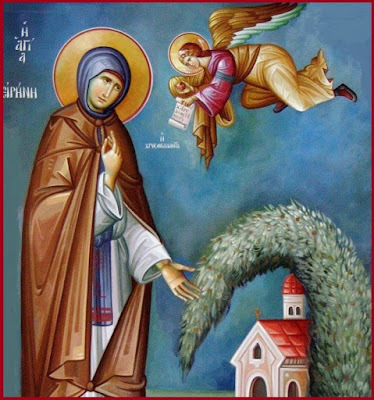 You were lifted up towards the height of heaven, and in venerable manner, the soulless cypress trees understanding this, bowed before you like rational beings, bowing before the height of your grace which translates towards a godly height those who cry out: Alleluia. Rejoice, love of those desiring to be perfect. Rejoice, holy servant of knowledge. Rejoice, unfading tree, reaching towards Paradise. Rejoice, lamp of divine goodness. Rejoice, most-precious beloved one of God. As you were seen to be chaste and mindful, through your prayers to God, you delivered your servant Nicholas from his terrible possession, and he then glorified you, crying out to you in peace, O Mother: Alleluia. Rejoice, fellow-dweller with all the Venerable Saints. Rejoice, fellow traveler of Ascetics bearing many virtues. Rejoice, astonishing array of many kinds of gifts. Rejoice, for you shine upon the minds of those approach you. 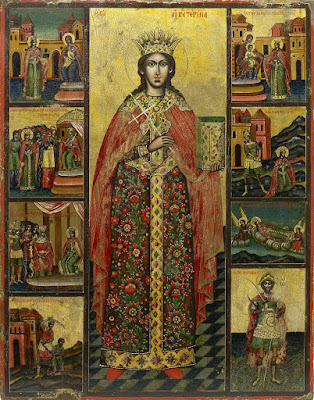 All the multitudes of the Orthodox offered hymns of victory, and divine fragrance, having gathered at your divine body, together with the Hierarchs and Leaders, and their life was filled with fragrance, for those who glorified you, crying out: Alleluia. Rejoice, shameful stench to the enemy. Rejoice, deliverance from every passion. Rejoice, mystical deliverance against soul-corrupting pollutions. Rejoice, for you cleanse the bosoms of their souls. Rejoice, steadfast defense against enemies. Rejoice, fervent protector of those who cry out. Your pour forth the grace of peace, O Mother, truly as another life-giving spring, for you drown hateful bitterness as drowning waters against this wretchedness, cleansing those who cry out: Alleluia. Rejoice, ethical myrrh honored by God. Rejoice, treasure of godly goodness. Rejoice, glorious boast of pure Ascetics. Rejoice, guide towards total peace. Rejoice, through whom we are filled with love. Rejoice, the healing of my soul. O All-hymned Mother, who has found the Word Who is holier than all the Saints, (3) receive these our salutations, and deliver from every evil of the devil, and save from all trials, those who cry out: Alleluia. Elder Symeon Kragiopoulos: Are we recipients of God’s compassion? Are we recipients of God’s compassion? The prodigal son from the first moment realised his mistake, his failure, but he did not immediately return to his father. Instead, he tried managing to live far away from him. Stubbornly, he tried to justify himself. But when he ends up in dire need, this causes him to come back to himself, to think correctly, to repent, and to take courage, the courage to go to his father and to confess everything he feels he did against him. There is always a tendency in man to want to appear honourable before God, having the conviction that he is something. Man must be hit hard, to feel that he is unworthy of salvation. Man ought to rely οn God, οn the Father’s compassion. Every sinner is saved by the sacrifice of Christ and not by any human virtue of his. 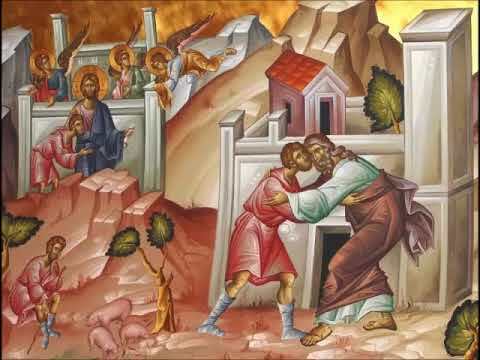 When someone passes through the misfortune of the prodigal, when he is vanquished like this and is later found in the arms of God and enjoying his love, he will never leave no matter what. He is happy, because he has found the Father. He stays and tastes of his mercifulness. No matter how much we have fallen, God is waiting for us to return without justifying ourselves, so as to give us all his goods. Today’s parable shows that he who fell greatly, very greatly, is saved, because he repented. He repented and was saved. And so I wonder, are we the recipients of God’s compassion? Rejoice, O Catherine, most wise bride of Christ! Rejoice, thou who through the wondrous economy of God wast instructed in the understanding of the greatness and glory of Christ the Son of God! Rrejoice, thou who wast reborn in the holy font! Rejoice, fulfillment of the sufferings of Christ! Rejoice, thou who didst join chorus with the holy virgins in heaven! Rejoice, thou who like a dove art also resplendent with meekness in the blessed kingdom of Christ! Seeing herself found worthy to receive a vision, the blessed Catherine hastened to the holy elder who had before entrusted the icon of the Mother of God to her; and she recounted to him how Christ, Who had appeared to her with His all-holy Mother, had hid His face from her, calling her foolish, poor and of mean birth, until such time as she forsook the infamy of idolatry. And hearing this, the venerable one instructed her in the mysteries of the Faith and baptized her; and in the renewal of the Spirit, she chanted to God in thanksgiving: Alleluia! Rejoice, for thou didst make foolish the wisdom, glory and riches of the world! Rejoice, for thou didst truly receive from Christ a most marvelous ring for thy right hand, as a token of thy betrothal to thy heavenly Bridegroom! Rejoice, receptacle of the fragrance of the Most High! Rejoice, cedar of Lebanon growing to a great height! The power of the Most High then gave to the holy Catherine the boldness fearlessly to denounce the impious Emperor Maximinus for offering sacrifices unto idols; and he was struck mute for many hours, unable to gainsay her words; and she chanted unto God in thanksgiving: Alleluia! Rejoice, dove who didst ever strive earnestly to preserve the purity of thy soul and body! Rejoice, for, exceeding zealous for the glory of Christ thy heavenly Bridegroom, thou didst strive in every way to lure erring people into the net of the Faith of Christ! Rejoice, for, directed by the divine commandments of the Master and afire with love for Him, thou didst earnestly hasten to the struggles that awaited thee! Rejoice, most radiant morning-star, heralding the dawn of salvation for those who through thee came to believe on Christ! Rejoice, sanctified wall of the fold, guarding the sheep of Christ against the ravenings of the noetic wolf! Stirring up a tempest of wrath against the holy virgin, the emperor said to her: "Speak not evilly to me against our gods!" But the holy Catherine replied: "If thou desirest to shake the darkness of delusion from the eyes of thy soul, understand that thy gods are evil, and accept the true God Whose name, when merely uttered, or Whose Cross, when traced in the air, driveth away and destroyeth thy gods. If thou commandest, I shall disclose to thee the Truth, chanting unto God: Alleluia!" Rejoice, for, possessed of divine knowledge from heaven, thou didst right boldly and courageously put to shame the proponents of knowledge falsely so called! Rejoice, for, having made thyself steadfast by thy manner of life and constant reasoning, thou didst trample the falsehoods of the noetic foe underfoot! Rejoice, melodious organ of the Spirit; rejoice, revealer of the mind of Christ! Rejoice, thou who wast enflamed with the seraphim's love for God! Rejoice, most wise of the wise; rejoice, thou who didst sharpen the sword of the Spirit against unbelief! Rejoice, dispeller of impiety; rejoice, instructor of the faithful! 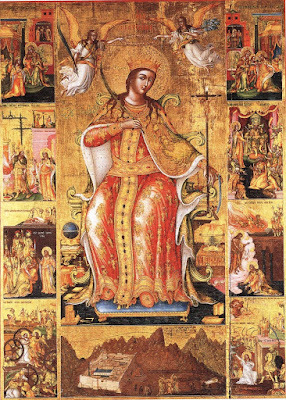 Thou wast like unto a divinely radiant star, O Catherine, having by thy wise words prevailed in argument over the fifty rhetoricians and guided them to the Christian path that leadeth to Christ God, the Sun of righteousness, Who shone forth from the Virgin; but, condemned for Christ's sake to immolation and accompanied on their way by thy prayers, they joyously entered the fire, chanting: Alleluia! Rejoice, thou who didst trample the perfidious serpent underfoot! Rejoice, for, having stripped the gods they worshipped of their veneration, thou didst hold them up to mockery! Rejoice, good confession of the Faith! Rejoice, keeper of eternal laws! Rejoice, for the light of Christ having illumined those who disputed with thee with faith, received them unto salvation! 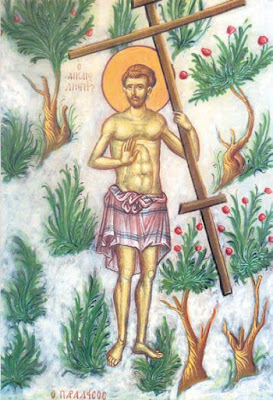 Zealous to imitate the preachers and God-bearing apostles, thou didst boldly proclaim Christ the true God in the tyrant's presence, and throughout thy floggings and imprisonment thou didst chant to Him: Alleluia! Rejoice, for, imitating Chris, thou didst willingly go forth to suffer! Rejoice, all-honorable source of ineffable miracles! 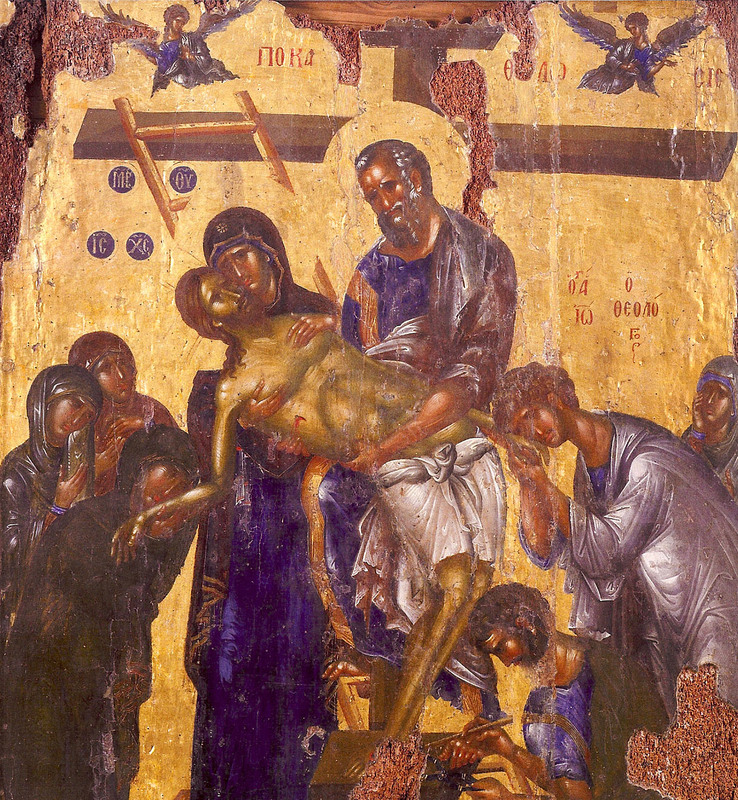 Rejoice, thou who didst bear the wounds of the Lord upon thy body! Rejoice, for thou wast a light amid the darkness! Rejoice, speedy liberator from the bonds of sin! Rejoice, swift healer of the sick; rejoice, aid of our salvation! The godless Emperor, wishing to lure thee into idolatrous worship abominable to God, again set snares for thee, O all-wise one, seeking to distract thee by falsely praising thy beauty; but thou didst call beauty a transient thing and one that quickly passeth, and confessing Christ to be the living and true God thou didst chant unto Him: Alleluia! Rejoice, for on thy body thou didst cause the radiance of God to blossom forth! Rejoice, for in the strength of that love thou wast shown to be victorious, uncowed by fear or the cruelty of torture! Rejoice, for through the wounds thou didst suffer for Christ's sake thou didst desire to be adorned in vesture of truly royal purple! Rejoice, for thou didst cut down the cruel one's hopes of weakening the strength of thy resolve! Rejoice, glory of companies of athletes! Rejoice, fear of the infidels! Beholding the strange renunciation of glory and the suffering for Christ of the empress, the general and his soldiers, let us betake ourselves far away from the world and the flesh, and soar aloft to the knowledge of God. For He is the beauty, the glory and crown of us who sing: Alleluia! Rejoice, for, having endured the painful tearing away of her breasts and decapitation by the sword, through thee she was manifestly deemed worthy of the everlasting kingdom of heaven! Rejoice, thou who didst illumine the companies of soldiers, benighted by idolatry, with thy virtues as with the rays of the sun! Rejoice, thou who didst gladden the Master of the heavenly hosts with the sweet song of thy confession! Rejoice, thou who didst seek Him Who was begotten before the everlasting hills like a hart upon the mountains of spices! Rejoice, for thou didst arrive at the calm haven of ever-blessed life! Rejoice, for thou didst undertake the struggle of suffering out of love for Christ! 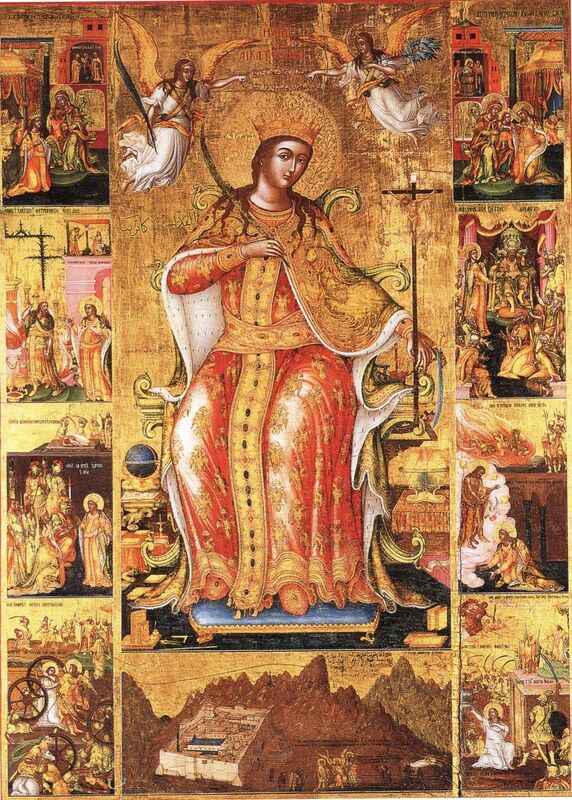 Every angelic being was gladdened with joy, beholding thee, O most glorious Catherine, victorious over the dark prince of this world; and it welcomed thee into the heavens as a triumphant commander preceded by a company of martyrs, and chanted hymns of victory, crying aloud to God: Alleluia! Rejoice, thou who didst acquire the mind of Christ! Rejoice, thou who didst make plain divine dogmas! Rejoice, adornment and confirmation of the city of Alexandria; rejoice, beauty and boast of Mount Sinai! Rejoice, thou who by the purity of thy soul and body didst reveal the unburnt bush! Rejoice, O most glorious one who dost release those held captive by the dark foe! 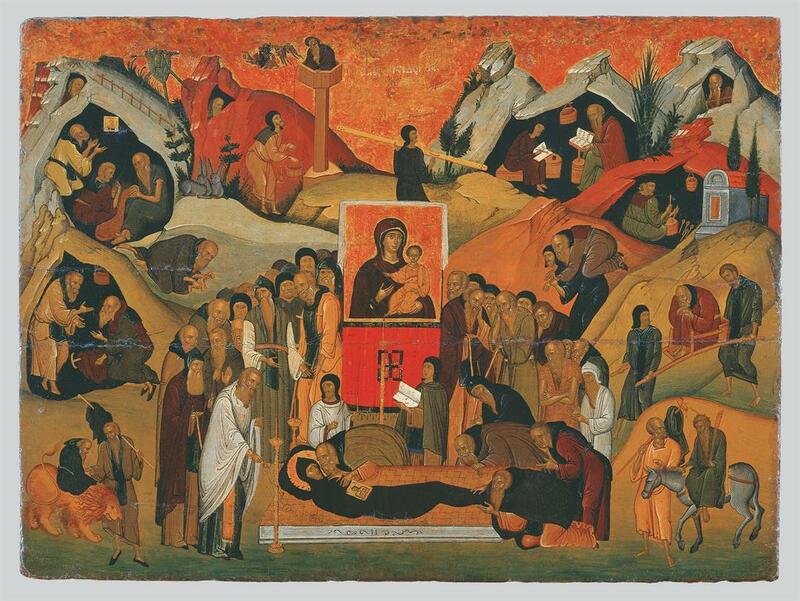 Rejoice, boast of martyrs and teacher of piety! Desiring to save thy soul, thou didst disdain thy body, O Catherine, and having given the tyrant thy consent to be beheaded, thou didst joyously depart hence, chanting to Christ God, thine immortal Bridegroom: Alleluia! Rejoice, thou who with patience didst bring to a goodly end the course of thy struggle! Rejoice, for as was meet thou didst enter into the heavenly bridal chamber of Christ! Rejoice, for by thy blood thou didst manifestly cry out to Christ thy Bridegroom: "I flee to the fragrance of Thy noetic myrrh which hath flowed forth, O my Bridegroom"! Rejoice, for thy divinely wise prayer was acceptable to God; for those who call upon thy name with faith doth the Master save from temptations, granting them good health and delivering them from afflictions of soul and body! 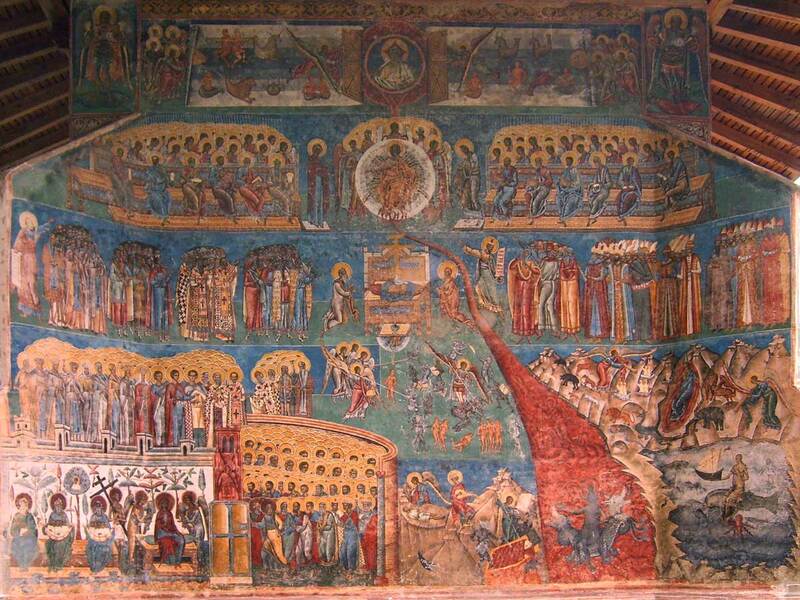 Rejoice, adornment of martyrs; rejoice, mighty refuge of Christians! We have dared to offer thee hymnody of praise, and if it be that discourse faileth, the mind is at a loss what to say; yet thy most wise discourse, which rescued many from ignorance and the infamy of idolatry, moves us to chant to God, Who rendered thy mighty deeds wondrous: Alleluia! Rejoice, thou who didst attain unto the heavenly Zion! Rejoice, cup drawing forth joy from the abundance of the house of God! Rejoice, for in thine incorrupt body thou dost rest on the mountain of the law, where the movement of the God of Sinai had been seen! Rejoice, for through thee is the Mother of Life worthily hymned in the midst of timbrel-playing maidens! Rejoice, incense of prayers, offered up in our behalf, being well-pleasing to the Master! Grace hath been given thee by God to guide men to the knowledge of His truth which is hidden in mystery, and to grant unto all those requests which are profitable. 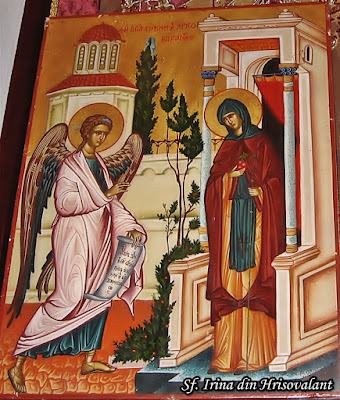 Wherefore, we entreat thee with compunction, O wise virgin: illumine the eyes of our minds and set forth for us a passable way to heaven, that with thee we may hymn the one Source of wisdom, now and for all ages, chanting: Alleluia! Rejoice, thou who hast been arrayed with the power of the Most High! Rejoice, commander who sent forth the company of God to eternal greatness! Rejoice, thou who standest in the choir of fiery servants, before Him Who dwelleth in light unapproachable! Rejoice, thou who tastest of the ineffable sweetness of the good things of paradise! Rejoice, for everlasting glory illumineth thee! 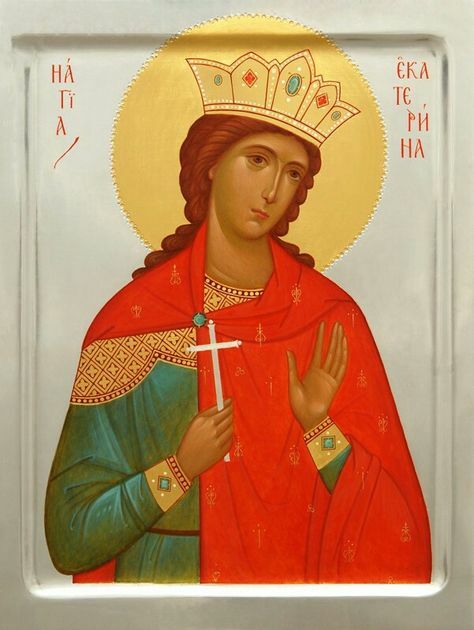 Rejoice, thou who hast been crowned with the crown of the kingdom of heaven by the Godhead in Three Hypostases; rejoice, mediatress of grace and endless glory for us! 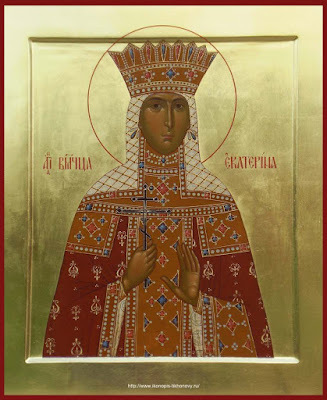 O holy great martyr Catherine! Receiving this hymn of praise, never cease to pray to the Lord in our behalf, that He deliver us from our enemies, visible and invisible; and by thy right acceptable mediation vouchsafe unto us the everlasting kingdom, that with thee we may chant unto God: Alleluia! O holy Catherine, virgin and martyr, true bride of Christ! We beseech thee as one who received a special grace whereby sweetest Jesus, thy Bridegroom, appeared to thee, that having put to shame the tyrant's deceits by thy wisdom and vanquished the fifty rhetoricians, giving them heavenly doctrine whereof to partake and leading them to the light of the true Faith, thou mightest likewise ask for us that same wisdom of God, that we also, having rent asunder all the snares of the tyrant of hades, and spurned the temptations of the world and the flesh, may show ourselves to be worthy of divine glory, may be made vessels meet for the spread of our holy Orthodox Faith, and that in the tabernacle of heaven we may with thee praise and glorify our Lord and Master Jesus Christ, with the Father and the Holy Spirit, unto all ages. Amen. O holy great martyr Catherine, chosen vessel of purity, pillar of Orthodoxy, our intercessor of good cheer, struggler for the law, saint who sleepest a holy sleep on the holy mountain! Because thou thyself hast revealed to Christians that they should ever pray to thee, we earnestly entreat thee: looking down from on high, hearken unto the sound of our supplication, mercifully regard the misfortunes of us sinners, visit the gloom of our minds, cause us to think of heavenly things and not of those of earth. By thine intercessions make haste to overcome the lusts of our flesh, our passionate attachment to the world and the wiles of the evil spirits who with malice wage war against us; that by thine intercession we may be shown to be free of their malicious assaults in the days of this life and from their aerial interrogations after our departure. O all-wise virgin, grant us all that we ask which is profitable, for thou canst ask many things of thy beloved Bridegroom, Christ our God. We know that the prayer of a righteous man availeth much when it worketh with the goodness of the merciful God, to Whom be glory, honor and thanksgiving, unto the ages of ages. Amen. Your lamb Catherine, O Jesus, Calls out to You in a loud voice: I love You, O my bridegroom, And in seeking You, I endure suffering. In Baptism I was crucified so that I might reign in You, And died so that I might live with You. Accept me as a pure sacrifice, For I have offered myself in love. By her prayers save our souls, since You are merciful. "The Champion of Christ of great name..."